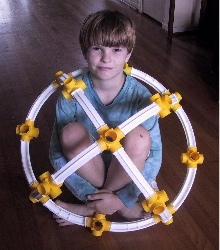 No Ends, a construction toy manufactured in Maine by Sagoma Plastics, is fairly limited in its geometric possibilities; it is a building toy consisting of straight beams, hinge pieces, curved beams, and six-direction 90 degree angle connectors, allowing the construction of spheres and rectangular solids. The one really great thing about No Ends is its size, which allows the construction of shapes large enough, in some cases, for even adults to climb inside. It can be fun once or twice as a party toy for adults, but is longer-lasting fun for a child who likes to toss a sheet over a framework to make a private little hut. There are also flimsy cardboard square panels which fit between the bars to make a solid wall. We have the large set which is marketed with instructions for building a large T. rex, but my eight-year-old still clamors for more, hoping to be able to build larger huts. The parts will not support much weight, so they cannot be sat upon, nor climbed upon. No Ends is as much fun as it is big! 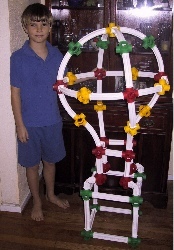 Build large structures with foot-long pieces. Beams and connectors link together to create real-life items or abstract forms. Contains 150 curved and straight beams and connectors in 4 bright colors.